Well known Youtuber and creationist Eric Hovind was invited by students to the campus to have an open debate with professors from all the science disciplines to discuss the validity of the material being taught on campus concerning evolution, creation of the universe, and humanism. Hovind has traveled the world and has been to every state in the union spreading the word of the gospel and that the word of God in the book of Genesis is the true creation story of the universe and mankind. 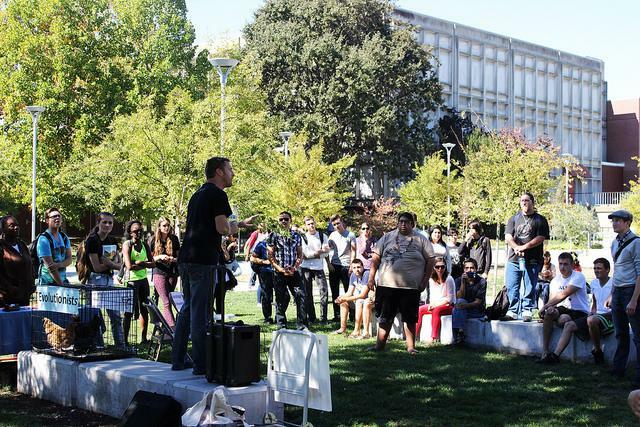 Hovind set up his debate on the lawn just in front of the Beaver Bookstore on one of the concrete benches. Chairs were labeled with the branches of science that he said he had been contacting for the past three weeks but none had responded or shown up. The most interesting thing he brought was a cage that was labeled “evolutionists” with four chickens in it. “These are your professors because they will not come out and debate with me about their religion of evolution,” Hovind said as he pointed to the cage. Although no professors showed up, the debate Hovind put on was open for students to participate in. ARC student Takylya Johnson spoke out against Hovind for calling people offensive names, saying it is a wrongdoing. “How are you going to stand here in front of all of these people and say it’s wrong to call someone an offensive name when that’s exactly what you’re doing by calling our professors on campus chickens? It may not be that bad of a name to call someone but by saying that you’re teaching the kids in this crowd that it’s OK to call someone that,” said Johnson. ARC student Henry Von Dollen decided to partake in the debate because Hovind said evolution is a hoax. “He said evolution is a religion itself. When I brought up Noah’s Arc he claimed that animals didn’t evolve from evolution but that God created many different kinds of animals to begin with. That was a hot topic for me because I’m a science major,” said Von Dollen. Johnson and Von Dollen found out about the debate by seeing it on their way to class. Toward the end of the debate, Hovind encouraged audience members to take a free bookmark he was offering that had a link to the website for the cause he supports. 5 Comments on "Well known anti-evolutionist visits ARC"
Too bad, nobody asked him about his father who spent the last eight years in jail for tax evasion. Eric and his daddy, convicted felon Kent Hovind, both go “cluck, cluck, cluck” when given the opportunity to face me and discuss matters of mutual interest and public importance. To date, I have been unable to verify that Eric (dba God Quest, Inc.) has filed his Form 990 with the IRS for fiscal period ending July 31, 2014 or that he is following the law and the regulations that require him to make it available upon request for public inspection and copying at his place of business. Kent, similarly, refuses to come out to me and discuss the false legal narrative he has been promoting for years and has pledged to promote for the rest of his life. Challenging actual scientists to a debate (which is not how science works) is a common creationist dirty trick. Hovind (whose creationist father is in Federal prison) was just trying to gain legitimacy for his scientific illiteracy by stealing the legitimacy of the professors. They rightly paid no attention to him, just as they should for any other street person. Someone should point out to Eric that we don’t debate against creationists for the same reason we don’t bother with people who think pyramids are used to store grain. There comes a point when you just need to say “you know what…i got better things to do”.